For someone who loves the Italian Riviera as much as I do, it’s kind of lame that I don’t explore the unfamiliar territory enough. However, there’s a reason for this: I’m so taken with the towns that I already hold near and dear to my heart. If I’m staying for longer than weekend, I usually arrive with some sort of plan to venture off, but once I’m there, I honestly prefer to just sit still. And it’s not because I’m a lazy buffoon who doesn’t want to step outside my comfort zone. I’m not. It’s impossible for me to sit still in Milan and I love learning about and seeing new things/places. When I’m not watching Game of Thrones, I’m always up and at it doing something, but as soon as I park myself on a lettino at the beach, all feels right in the world and I don’t want to move unless it’s to go for a swim. I prefer to relax and unwind on the beach instead of making my rounds through the enchanting towns and villages that flood my Instagram feed. However, I’m happy to say that thanks to my friend Christine (of La Cantina di Miky! ), I spent a lovely morning on the pristine beach of Framura followed by lunch at L’Agave restaurant. 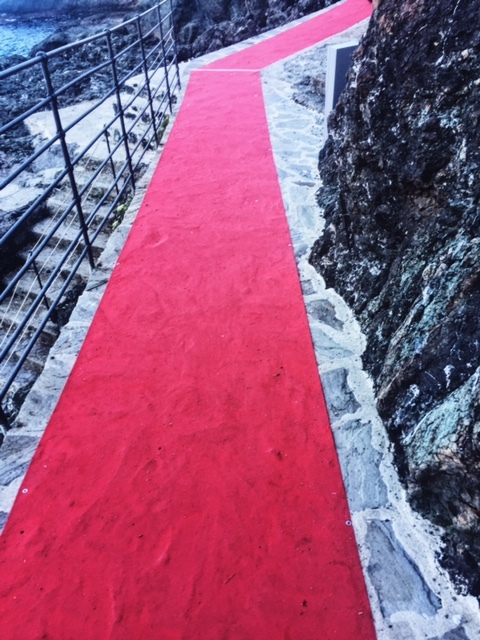 The red carpet of Liguria! The promenade views don’t get any better than this! 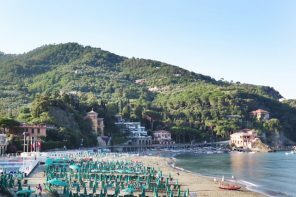 Just two simple stops from Levanto by train, Framura is one of those Riviera towns where the real estate is perched high in the hills and the beaches are relatively less crowded than those to which I’m accustomed. So, we walked along the red carpeted promenade to arrive at Vallà beach, where there were no formal beach clubs (though a man did rent out umbrellas). 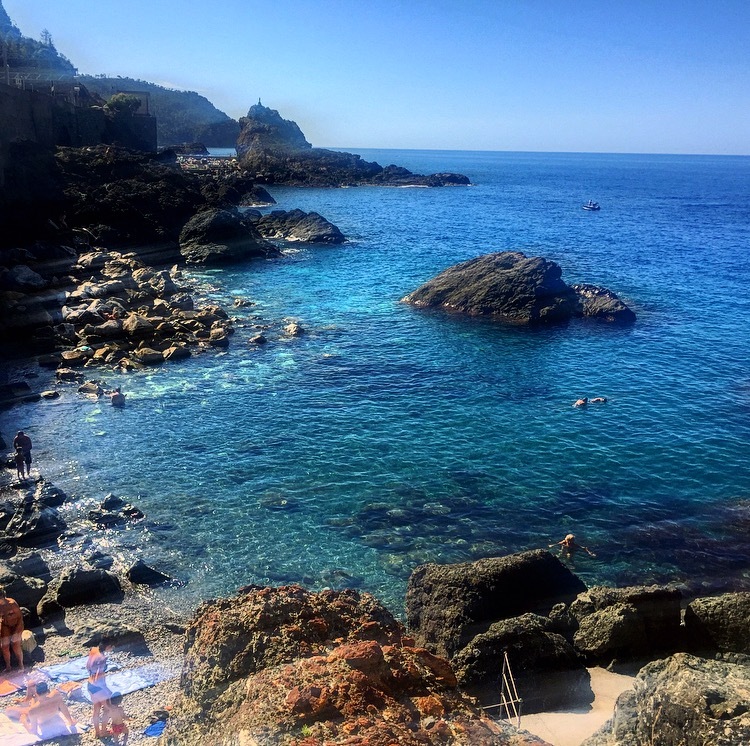 The serene pebbly beach had super clear water with lots of fish…in particular the kind that start nibbling on the legs of anyone standing still, feet planted on the sea floor! They’re harmless of course, but that’s a sensation I don’t enjoy, so I would enter the water really fast and just float away without resting my feet on the sea floor. Framura as a whole was such a treasure that I was almost hesitant to write this post, but then I caved. 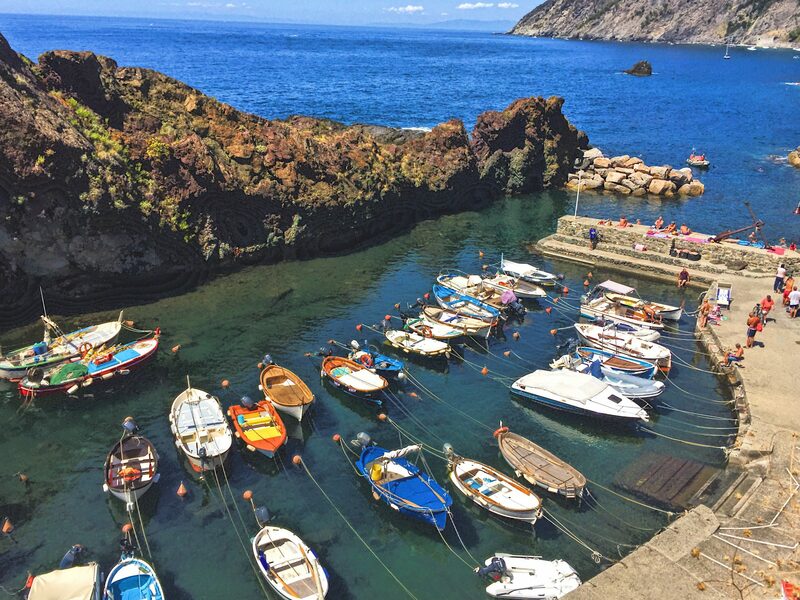 L’Agave restaurant sits inside a modern building built into a seemingly centuries old rock wall perched high above Framura’s harbor, an inlet so crystal clear that you can see all the way to the bottom! The charming family-run establishment also lies just at the end of a bike path in an old train station that connects Framura to Bonassola and Levanto. 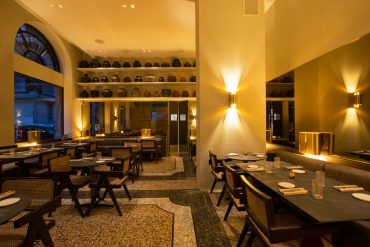 Owner Marco Rezzano opened L’Agave in 2016, and he runs the restaurant with his wife Luisella and daughters Elisa and Sofia. He’s a wine world bigwig, the Consigliere Regionale for Liguria in the AIS sommelier association. 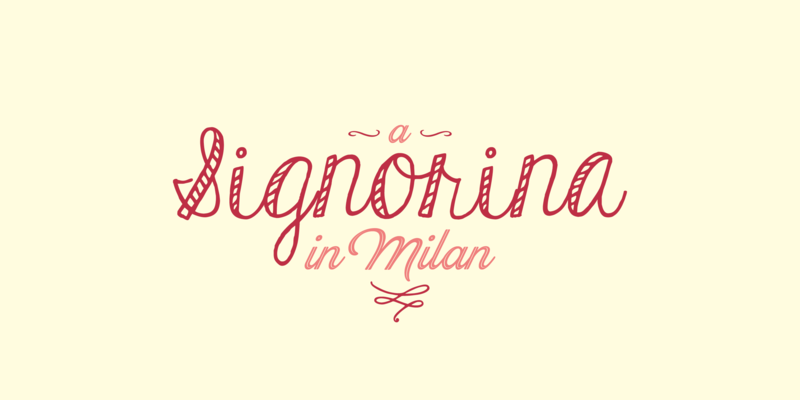 The relatively unsung wines of Liguria feature prominently on L’Agave’s remarkable, predominantly Italian wine list. Upon arrival, we walked through the minimal dining room housing a handful of tables to take a seat on the patio, from which we looked down at the harbor, across the Mediterranean sea and into the horizon….everything was blue and it was beauteous! Local focaccia was placed on our table and I was already in my glory. L’Agave’s small menu highlights the region at its finest, comprising two antipasti, which included Cundijun, a take on a classic Nicoise salad and two pastas: house-stamped corzetti with white pesto and marjoram and fiorellini with shelled mussels and saffron (I love pasta cooked in saffron water!). I wanted both, but I chose the fiorelinni. Of the three entrees, I opted for acciughe e calamari all’agave (fried anchovies and calamari, L’Agave style) as I have a soft spot in my heart for fried things.. Both the fiorellini and the fried fish were outstanding. 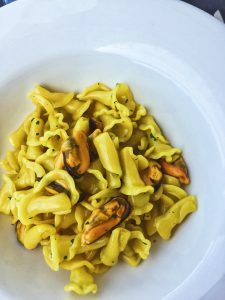 I loved how the pasta was light, the mussels were shelled and the addition of saffron, a spice that’s so Milan, which to me rendered this dish a smart marriage of the flavors from two places I adore (my dear Milano and the Riviera!). 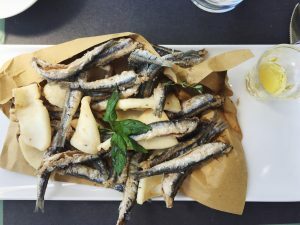 For the fried fish, the dreamy batter contained rosemary and while it was thin, it still coated the fish sufficiently without being too heavy, giving each bite just the right amount of crisp. 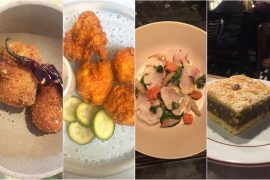 The dish was accompanied by a sweet and sour dipping sauce made from a reduction of apple vinegar and sugar with a touch of white pepper, a combo that only enhanced the crispiness and the flavor of the fish. It was delightful! At such a wine-centric restaurant, you might be wondering what we sipped on? 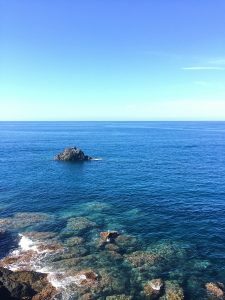 A Ligurian metodo classico spumante! 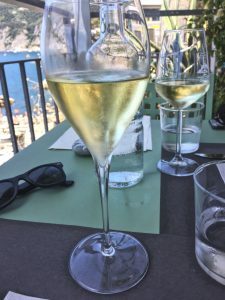 Not that I think I’m any kind of be-all end-all authority when it comes to anything pertaining to Italian wines (or wine in general for that matter), but I had no idea that any producers in Liguria were making metodo classico wines. The Baia delle Favole spumante I chose was made in Sestri Levante from the Pigato grape. It was crisp and refreshing, and the acidity paired especially well with the fried fish. 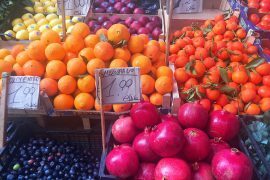 If you’re in Liguria, particularly in the Cinque Terre area, take the time to visit L’Agave restaurant. It’s a gem, and you won’t be disappointed.